Monkton Farleigh Mine is the largest of the three Central Ammunition Depots and consists of 80 acres of tunnels and storage districts. 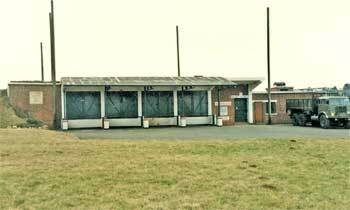 Built during WW2, it was decommissioned in 1965 and sold off in 1976. After many years of fruitless wrangling between landowners and planners, Monkton Farleigh Mine was almost destroyed by theft and vandalism. In 1984 this once Top Secret establishment was rescued by volunteers who launched an ambitious programme to restore the mine and open it to the public. Click on the button above for a tour of Monkton Farleigh Mine. a slope shaft which descends 100 feet below ground.